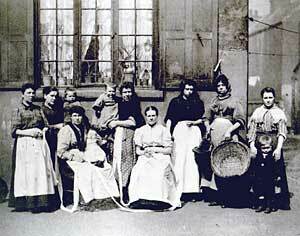 Poor female lace workers (images courtesy of Picture the Past). The Charity Organisation Society were founded in England in 1869 following the 'Goschen Minute' relating to the Poor Law and which sought to severely restrict outdoor relief distributed by the Poor Law Guardians. The Society led by Helen Bosanquet and Octavia Hill, supported the concept of self-help and limited government intervention to deal with the effects of poverty. In Nottingham the Society was founded in December 1875 by Henrietta Carey as a sub-committee of the recently formed Town and County Social Guild which explored new solutions to problems of the poor. The NSOC is currently known as Nottingham Community and Voluntary Service (NCVS) and is situated at the bottom of Mansfield Road near to one of the earlier offices. In January 1876 the NSOC set up to work with Poor Law Authorities and supervise and systematise existing activity, aiming to improve the condition of the poor and prevent them from having to go into the workhouse; their first case was in March 1876. The Committee was made up of men and women from the educated middle and upper classes; doctors, lawyers, the clergy local officials and their wives and daughters. The mid-Victorian period saw the rise of middle class and upper class women becoming involved with religious and philanthropic organisations, focusing on women, children and the poor. The range of benevolent activities undertaken by these women is significant. Not only did they donate money, they raised money through bazaars and social events, visited the poor in their homes, prisons and orphanages, hospitals and workhouses and organised charity, indeed charity was to a great extent associated with and administered by women. In the first volume of its Annual Report of 1876 the ‘Objects’ of the NSOC were set out, which was to supply information concerning the ‘deserving’ poor and was to ‘make enquiry and supply information concerning applicants for charity.’ Other obligations of the NSOC was to detect impositions constantly practised by the idle and profligate; to repress mendacity; to keep a register of persons requiring employment; to bring existing local charities into cooperation with this Society, with one another and the Poor Law authorities and to give temporary assistance where necessary. It was not a society to give charity as such but to be a conduit for helping the deserving poor to obtain short term help in their hour of need. The NSOC believed there was too much ad hoc charity in Nottingham which encouraged the idle and profligate to live a wasteful life. Each of the twenty six Annual Reports contain a list of Rules and Principles of Relief adopted in 1876 by the Society. A set of Regulations as to Lady Visitors is listed in the later years and this is followed by the Accounts sheet and then the list of Subscriptions and Donations. The Society received monies from Annual subscriptions, one-off and regular donations, through fund-raising activities eg concerts and fairs, support from the Corporation and legacies. It is interesting to read the list of some of the subscribers and donors who were involved. It reads like a who’s who of the great and good in Nottingham at the time. For instance; J.Turney of Trent Bridge Tannery, Mayor of Nottingham; TC Hine family (architects); Lord Bentink; Lady Belper, married to Edward Strutt, 1st Lord Belper; Duchess of Portland; Jesse Boot; Mrs Felkin (lace manufacturer); Leavers family (lace manufacturer); J D Player; Miss Hawksley; Tarbotton Hawkesley (water engineer); Messers Foreman (newspaper); Watson Fothergill (architect); J T Spalding (Griffin and Spalding); Drs Seaton and Boobbyer (Medical Officers of Health); Viscount Newark, Sir Charles Seeley (JP and High Sheriff as well as being heavily involved with the General Hospital) and the list goes on. Many of these people were also on the board of other charitable institutions such as The Nottingham General Hospital, The Nottingham Eye Hospital, The Cripples Guild and the Children’s Hospital. The Reports contain the often frustrated views of the author, increasingly annoyed at the constant complaints aimed at the NCOS, by members of the public and those who had a ‘voice’ and that instead of charity being funnelled through the NCOS it was still being dispensed through giving monies to people ad hoc. Included in the Report are examples of who had been helped and in what form, for example help in illness, convalescent aid, emigration or railway tickets. There are examples of requests for help and the system of dealing with them. Some were dismissed, others were helped with tools, visits by Lady Visitors or help in seeking work elsewhere by means of a railway ticket or even emigration. One section of the public who did receive help were elderly people. There was no state pension at this time. Relations, friends and former employers were asked to contribute very small amounts to make up a regular pension. Even wealthier people were invited to donate money to ‘adopt’ a needy elderly person. NCOS ticket (courtesy of Nottingham CVS). Subscribers to NSOC and others gave out tickets to poor people seeking relief. The recipient would be issued with a ticket to enable them to do this and would present the ticket at the office so that enquiries could be made. When they visited the offices they would be seen by Mr E Hummel, an ex-policeman, who was the Enquiry Officer for 20 years until his death in 1895. All applicants had to approach him before they went any further. At the offices applicants would be asked for his and his family details and employers details. He or she would then be asked to return at the next meeting whilst enquiries were made by both letter and telegraph. Names were received on a weekly basis on Wednesdays and Saturdays and a decision-making committee met on Tuesdays and Fridays to decide what relief could be given. This was the period when the genuine applicant was disclosed. Many gave false addresses or employer’s details. In 1876 report states that ‘sturdy vagrants’ would become aggressive when asked questions and then refused charity on offer, vindicating the Society’s enquiries. The number of people initially wanting help was usually reduced after the initial enquiry either by them not turning up, being refused for whatever reason or being referred to the Board of Guardians. This weeding out of applicants was done through detective work; writing letters, making enquiries and using newspapers to help catch out and to publicise those who were not genuine. For instance in 1877 3 adult and 13 Italian children were brought before the magistrates on such a charge. There were often complaints, both from the applicants themselves and also from those who had put their names forward, that they have been ignored or neglected; this was not the case as food in the form of bread would be offered and there was also the workhouse for shelter. From over 500 applicants in 1876, 169 never bothered to come back, 72 were deemed not deserving and a further 79 were referred to the Board of Guardians. Approximately 400 cases were considered annually. George Street and Broad Street in Nottingham, c.1900. The Society had three different addresses in Nottingham in the first 25 years. In 1876 they had offices at 58 St James Street. There was a problem with these premises as many beggars visited this address for bread which was then ‘sold’ on by the beggars. It caused some difficulties and finally the offices were moved in 1895 to 18 George Street where they remained until 1898. The new premises were located at 14 Broad Street and consisted of two rooms, close to the poorest portion of the city, being on a thoroughfare from the Lace Market and people began to know of the offices and it was more pleasant than the George Street offices. The opening hours of the St James Street offices were 12-2 and 5-7 and 12-2 on Saturdays but when the offices moved to Broad Street the hours of opening were 10-1 daily. Criticism was made of the amount spent on equipping, manning and use of such offices but this was counter-argued by the Society who claimed that in order to carry out all the work necessary they had to employ well-paid officers, have suitable rooms and be able to undertake all the paperwork in order to investigate thoroughly all applicants. Funds were raised and divided into two categories; Subscriptions and Donations. Letters often appeared in local papers to promote NSOC’s work and seek support. The subscriptions appear to have been on a year by year account but donations could be made as and when and often for a specific case. Over the 25 year period covered the amounts for subscriptions vary from £108 in 1876 to £204 in 1885. 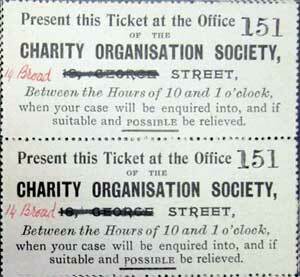 The total of donations could be as low as £2 guineas in 1882 and as high as £118 in 1905. The high subscriptions in 1885 correlates with a downturn in trade and much distress in the city. Any administration costs was taken from the General Fund and not from money donated to special cases. One of the key objects of the Society was to avoid money being given to beggars, vagrants and other notorious drinkers and wasters; the Reports of 1876, 1877, 1897 and 1899 highlight some of the problems these people caused. The close links with the Poor Law Guardians is evident in assisting the ‘deserving’ poor and excluding the ‘undeserving ‘ poor. The Society wanted to eradicate indiscriminate charity because many beggars reputedly made a living out of gaining money in this manner without having to do days’ work. Many had drinking habits and when they involved children begging it was not for the child but merely to fund this habit at the gin shop. The Society believed that this type of giving was calculated to relieve the feelings of the giver more than the recipient. Methods were put in place to try and avoid these people gaining money in this way. This idea was to gather information and then act upon it where they saw fit attracted much criticism from the wider public, who accused the NSOC of only helping only the ‘immaculate’ poor! The counter-argument was that those who had sunk into chronic pauperism could not be helped except by them going to the Board of Guardians who had close relations with NSOC, and where all able bodied men and their families would be helped. However, an illness of the breadwinner of the family could lead to permanent distress but by tiding over a crisis the family could be restored again to independence. If an applicant states he is hungry he is given as much dry bread and water as he can eat and this is an indication of his actual needs. As the years progressed the essential message of the Society was still that the Nottingham Society for Organising Charity was just that. They were not in the domain for handing out doles to anyone and these should be ‘avoided as they would sap the independence of the recipient’. In 1893 the NSOC stated there were two kinds of poor; the hopelessly poor and the poor in temporary difficulty for which a timely intervention could restore them to their independence of charity and the Society confined itself to helping the second category and left the first to larger organisations such a Parliament, Town Councils, Board of Guardians and Salvation Army to deal with the enormous numbers that involved. This idea to gather information and then act upon it where they saw fit attracted much criticism from the wider public, who accused the NSOC of only helping only the ‘immaculate’ poor! The counter-argument by the Society was that those who had sunk into chronic pauperism could not be helped except by them going to the Board of Guardians who had close relations with NSOC, and where all able bodied men and their families would be helped. However, an illness of the breadwinner of the family could lead to permanent distress but by tiding over a crisis the family could be restored again to independence. If an applicant states he is hungry he is given as much dry bread and water as he can eat and this is an indication of his actual needs. Many people, by this the general public, were ignorant of what help there was available and the NSOC could be a conduit to enlighten them. The accusations levelled at the Society that they spent too much money on administering the charity was incorrect but a strong well administered background was essential to run the organisation; there were so many charities in the town that the utmost benefit would be made to the community if a vital connection could be made with one another and organised so that each should work in co-operation with theirs. They did not desire to supersede private charity or even stop charity merely to ASSIST it. Their Reports were not sensational records more like plodding accounts and often disheartening because they were blamed for not moving more quickly to offer charity, but the information contained in the Reports allowed members to take stock of the previous year’s work and more importantly to meet criticism and to clear up any misconceptions. What was given out as charity could vary from food handouts, short-term loans such as subscriptions to sick or benefit clubs for those unable to keep up their payments; help given to those needing short-term convalescence after an illness or to secure the services of a trained nurse. In 1896 convalescent treatment was given to 45 patients, mostly women and the average length of stay was three weeks. In most cases the patient had made a small contribution to their stay. There was no help available for chronic and incurable diseases such as consumption because there was no hospital or home for the dying in Nottingham. Drugs were donated by Boots and given out such as cod liver oil or Bovril; pensions for aged or infirm persons – these numbered around ten, these cases were looked into by the Lady Visitors and the money came not from the NSOC but from relatives, friends or old employers; help given for people to purchase tools of their trade and help in emigrating, in 1897 two people were assisted. Many of these acts of charity were as a result of the NSOC acting as a conduit for channelling help. Men who came to the NSOC for help with finding work were often disappointed, because the work they were seeking was not available and they did not want charity to work as a ‘handyman’; in 1902 two men and a young boy were found work as models for an artist! However, women and boys could often be found work as charwomen, cleaners or sewer workers. Complaints of how the NSOC dispensed their charity can be found in two particular years, 1885/6 and 1904/5 when there was high levels of unemployment. The Nottingham Evening Post archives corroborates much of what the NSOC was saying both about the amount of poverty and unemployment but also what they were saying about ‘centralising’ poverty relief and not just giving ad hoc to beggars. The winter of 1885/1886 was particularly bad and there was a great deal of unemployment in the borough. The Rev Canon Morse, who had been a Committee member of the NSOC from 1877 to 1880, presented a memorial to the Mayor, on behalf of a number of clergy expressing their concern that relief work should be set in place. However, he pointed out that even once the relief work was established there would still be problems. As he puts it, “men who have been accustomed to a delicate handicraft (by this it is presumed he meant lace production) who have worked in heated rooms cannot be turned out in winter on a bleak hillside and set to do ‘navvy’s work’ without great risk. Alternatively, work has to be restricted to Nottingham householders, otherwise troops of unemployed agricultural labourers would be pouring into the town to get the employment on offer. On Monday 7 December the Mayor made a statement saying he had received several deputations revealing the number of unemployed was in the region of between 1000 and 1100 men and had been assured that these were genuine cases. A committee was arranged who sat that evening and the following day to discuss the distress. Their conclusion was that it was a matter for the Poor Law Authority and the Council would do all they could to assist. A letter printed the following Friday from the Executive Committee of the Notts Nonconformist Association heartily approved of the Council’s public subscription for the benefit of the destitute women and children of the town. In the 1885 Report of the NSOC it was noted that there was continued depression within the town but that they were all eligible for help from the Guardians and there was no justification for families being left in a state of starvation. The NSOC showed how useful they were in aiding the Corporation to distribute the funds at their disposal to deserving cases. During this period the Penny Dinner Movement was established in Nottingham which provided meals for the poor children and was organised by the Social Guild. Rooms were opened and ‘nutritious and wholesome food’ was provided for a large number of children. The NSOC approved of this movement as the money paid by the children covered the cost of the meals and other expenses were paid for through subscriptions. A concert was held on 12 December 1885 at all Saint’s School, Forest Road by the pupils of the Ladies’ College, Rob-Roy Terrace to raise funds for the movement. The following Wednesday a letter appeared in the newspaper from the Secretary of the Social Guild, THB Ferris, emphasising the plight of the poor children and asking for donations of clothing and shoes. This act of charity fell in line with that of the NSOC because there were visits made to the houses by some lady volunteers who distributed such clothing. Donations were also requested to be left at the Guild’s rooms which would then be turned into dinners for the children. The other Association which the NSOC approved was the Boys Brigade. In 1885 they provided employment for twelve or thirteen ‘Arab’ boys and also arranged country holidays for school children. During the month of December 1885 there were several large gatherings of unemployed men in the borough, numbers assessed ranged from 1,500 to 1,800 and collections were made and distributed ostensibly to the unemployed but without proper authority. When they were challenged to show how many people were suffering from the effects of trade downturns, only a handful of names were sent forward as being in desperate need. This was the scenario that the NSOC were hoping to avoid. The authorities also took a dim view of this and hoped that the police would take anyone found collecting into custody. The NSOC used this period of distress to write to the Editor of the Nottingham Evening Post to publicise the charity and what they could offer. Help could be offered in the case of temporary unemployment; where distress was caused by temporary illness; for payment of travelling expenses to obtain work; where a little outlay would help a person on his way; if someone had to go into the workhouse their furniture could be stored free of cost; where the man was submitting to the labour test, the Society could help in other ways. The letter was signed by Claude Hollins and J Kentish Wright. It is interesting that the number of applicants for each month of 1885 is not that much more than other years where there was more employment and less severe weather. During the years that the NSOC had commenced its work there was always a call for more subscriptions and in periods of severe weather and falling employment this was especially so. The year 1885 reached a peak of over £204.0.0 in subscriptions but after then the amounts began to fall back but remained between £160 and £180. Each year the Report always asked for more people to make subscriptions or donations and to not give indiscriminately to undeserving paupers. In 1890 the Report commented that the statistics of the relief given by the Guardians suggested that there was an improvement amongst the poorer classes and a decrease in the numbers requiring assistance partly because of an improvement in trade and greater demand for workers but also that many workers, especially in the building trade, had left the town and migrated to other towns. A decade after the 1885 slump, there was another downturn in trade, this time over the winter of 1904-5. Trade conditions grew gradually worse during 1904; even in the summer of that year there had been a scarcity of work and families were finding the winter very difficult, especially the building and allied trades. Towards November the distress became ‘exceptional’ and as a consequence a Special Committee of the City Council was formed to deal with the problem of unemployment. The local newspaper ran an article on the ‘Unemployed Problem’. A Special Committee was to enquire as to the pauperism in the city of Nottingham. There was an increase in the number in the workhouse and of the outdoor poor compared to 1903. There appeared to be some confusion amongst those on the committee as to why this was. It seems that most men were on short time but there was no exceptional distress because the organised trades were paying a large amount of money in out-of-work pay. In successive newspaper articles the plight of the children was highlighted. A letter supporting a scheme set up by a Mr J T Thompson, to help feed and clothe the poor children was followed by a letter from the Clerk to the Council, W J Abel, requesting clothing and boots to be taken to the Educational Offices where the teachers and visiting officers would know the real needy cases and therefore all gifts would be carefully distributed; something the NSOC would have been proud. The Queen’s Walk Congregational Church arranged to set up a soup kitchen and free meals for the children for the immediate neighbourhood. Subscriptions had been opened with good response and tickets (a system similar to NSOC) were distributed amongst the very needy and the first meal would be given at Congregational Schoolroom, Kirke White Street. Even the Prime Minister, Sir H Campbell-Bannerman, was questioned about the effects of unemployment and receiving poor law relief would have on a man’s franchise. Bannerman’s reply was that because a man was out of work he should not lose his citizenship. During this unfortunate period the NSOC came into its own, at last! In the Report it was reported that during the winter of 1894/5, the Mayor’s Fund was started and a portion of the money raised was handed over to the NSOC for distribution from the Society’s Office on the applicant’s unverified statement and on subsequent visits many false details were discovered. A decade later the NSOC was asked to undertake the whole administration of the City Relief Fund for the distress caused by the lack of employment. Consequently a different line was taken and each application was properly investigated. In 1895 bread was given out on a regular basis, in 1905 no bread was given but the Society was able to understand more what the real needs of the people were. Other charitable organisations that the NSOC was involved with were the Children’s Hospital Committee, Girl’s Preventative Home and Discharged Prisoners Aid Society. At this time the only hospital specifically for children was small, with only 32 cots in 1898 and although there was a capacity for out-patients this was fast being out-stripped. Many children suffered from diseases such as rickets, hip-joint or scrofulous diseases and were refused admission because they needed to rest for many months or were in need of a good diet and fresh air. The NSOC was able to help by first of all ensuring that each child was in fact from a poor family who could not afford treatment otherwise and secondly they could help provide children with convalescence at various homes both in Nottinghamshire and by the seaside. Unfortunately there is nothing written about the other two society’s mentioned. Minutes from the Eye Hospital show how the NCOS made regular enquiries on the hospital’s behalf to alleviate the medical staff who were becoming preoccupied by alleged abuses of the system for treatment. The NCOS made enquiries into the patient’s circumstances for those claiming free treatment as complaints had been made that patients with urgent need for treatment were being refused such treatment. What came out of this chance to prove themselves was that the NSOC were primarily an educative and organising body not a giver of charity. In the Charity Organisation Review in 1885 Allen Graham clearly set out what a Charity Organisation meant. It meant opening an office under a suitable person and the office should be a harbour of refuge to every person in distress and a place of consultation for everyone seeking to relieve distress. It meant investigation and advice of people in distress and opening up communication with every charitable institution in the locality. Certainly during 1904/5 the NSOC were able to put these words into practice. The two volumes are an interesting insight into the period of 1876-1905 and the view of how charity should be dispensed according to the Nottingham Society for Organising Charity. Whenever material from history is used it must always be handled both from the contemporary and the present day thinking and we must try to avoid putting today’s attitudes on the past. However, both volumes indicate that the NSOC was under no illusion that they were going to solve the problems of poverty of Nottingham but could answer their critics in a clear and confident way that their way was the best. It seems they were aware of their limitations in dealing with the overwhelming problem of poverty in this period. Poverty of the nineteenth century was far more difficult to deal with than in the present day. The NSOC cannot be dismissed as showing a lack of compassion. The organisation looked at the larger picture of poverty and realised that it could not deal with the greater mass of paupers and they should be left to be dealt with by people such as the Board of Guardians who were better placed to deal with the numbers and that the NCOS wanted to help those who were suffering temporary poverty in practical terms and this is what they tried to do. They tapped into the wealth of the city and appealed to their sense of duty and philanthropic nature to both find those deserving of help and also to donate funds to the cause. Many of these wealthy persons were involved in other charitable work so by attracting them was a shrewd move to both show how influential the NCOS was and also to gain increased funds for keeping their work going. What the NCOS wanted to avoid was giving to the undeserving; beggars, spendthrifts and drunkards. Their investigative work was quite forward thinking and proved to be a successful means of weeding out those who were trying to ‘play the system’. There were always going to be winners and losers but for those who were genuine they were helped practically and without the loss of dignity. Critics may claim that money and time was lost making these investigations but several examples have shown that this was not the case; the great numbers of unemployed men when asked to give more incisive detail as to who was in real need was cut back to less than a hundred. There has not been enough research into the NSOC but having examined newspapers of the time there is an indication that what was written in the volumes was actually occurring on the ground. What the volumes only tell us is what THEY wanted the reader to know and to shed a good light on the work of the NCOS and as with all aspects of history there are always two sides, if not more. Examination of the volumes highlights gaps in the knowledge that researchers would like to fill, such as, who were the critics? Is there a ledger giving the names of those who were helped over the period covered by the volumes? These and many more questions will hopefully be answered in the depths of time. There is a considerable amount of unarchived material on the NSOC going forward to 1940s.